American Contra Dance (also contradance, contra-dance and other variant spellings) refers to several folk dance styles in which couples dance in two facing lines of indefinite length. Contra dances can be found around the world, though they are especially popular in the United States. 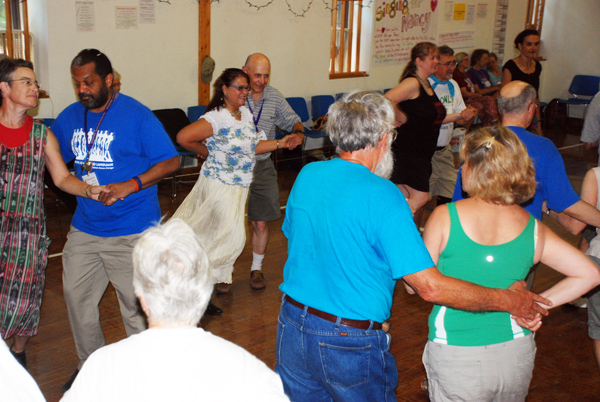 Contra dance is also referred to as traditional New England folk dance. A contra dance evening may include a few dances of other types including: Traditional American Squares, waltz, polka, schottische, swing, rounds, clogging, Hambo and other Scandinavian, and other types of couple dancing. Traditional American Square Dance is a catch-all term for styles of square dance that are not within the genre of modern Western square dance. This includes the regional styles that existed before the middle 1950s (when modern the Western style began to emerge as a new standard as figures and calls were standardized, regional differences were eliminated and new figures and calls were created); or styles that have survived or have been revived since the middle 1950s. In some communities in the United States and Canada, there are dance events consisting primarily of traditional squares, sometimes alternating with other styles of partner dancing, such as contra dance, round dance, mixers, waltzes, Scandinavian dance, Cajun/Zydeco dance and/or country/western dance. Square dance callers who call for occasional dancers, beginning-level dancers or brand-new dancers primarily use calls and figures from traditional square dance. Fr BHTH 8:00am 9:45am Squares, Contras, Mixers, etc. for the Morning! Sa BHTH 8:00am 9:45am Squares, Contras, Mixers, etc. for the Morning! Su BHTH 9:00am 11:00am Squares, Contras, Mixers, etc. for the Morning! Open Mike Opportunities at Workshops - During these sessions, there will be some limited opportunities for participants who would like to gain experience or showcase their talents in calling.